November Northern Arts News is Here! Please be sure to read Northern Arts News this November! There is so much more! 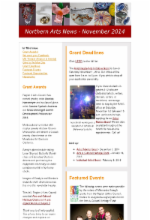 Grant deadlines, featured R2AC-funded events, opportunities for artists and arts-minded organizations. Our Arts Calendar is chock-full of up-to-date arts events in Region 2. Read Northern Arts News TODAY!